We are instrumental in providing clients with supreme quality Structural Blind Rivets. The Structural Blind Rivets offer solid-circle internal lock for high-vibration applications. Further, our range is available in a varied sizes and materials. 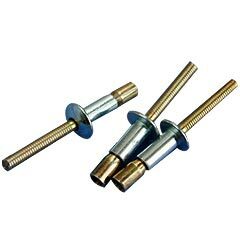 We offer the Structural Blind Rivets at market leading rates. With thickness variations of 3/8"